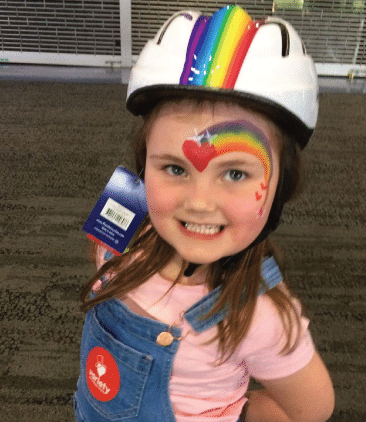 Hi, I’m Derryn Hinch and I’m inviting you to join me in giving a child like Hollie the magical gift of their first bike. The Variety Bikes for Kids program is dear to my heart. You see, since 2002 my loyal friends and listeners have rallied together to donate over 12,000 bikes to disadvantaged Aussie kids. Join me as we brighten a child’s life, one bike at a time. I hope you can give generously to support other children like Hollie this tax time. It really means so much. $218 buys a brand new bike & helmet. Best of all you get to see the joy on a child’s face as you hand them the bike! $160 provides a high quality bike for a disadvantaged child to ensure safe riding for many years to come! $58 for a helmet is a must to make sure our kids are safe when they are out and about riding with their friends. If you can only donate $10 or $20, that’s fine. It all goes towards a wonderful cause, helping local kids in need. Last year, I shared a personal story about receiving my very first bike as a 10 year-old boy. That Christmas remains one of my happiest childhood memories. My second-hand two wheeler represented so much joy and freedom. A truly magical experience that I wish every child to have. I have been lucky to share the magic of a first bike with many children in my life.One of those children is 6 year-old Hollie. Hollie’s brother Xzavier has special needs and was recently supported by Variety. Hollie was always by her brother’s side with a bravery and a selflessness beyond her years. We come across this often in our work. A child with special needs places such a demand on a family that siblings can get overlooked and often miss out. We knew we had to do something for Hollie too. Of course you know what that is. We gave Hollie her first bike! The joy that a first bike brought to Hollie is something that has stayed with me and one of the reasons I am writing this to you today. As a result of generous donors like you, I believe we created a lifelong memory for a little girl that day. Hollie’s new bike represented so much more than two wheels and a helmet. It held the promise of freedom and independence that has been lacking in her young life due to her family circumstances. And even more than that, Hollie felt special and loved that day! Don, 2017 Variety Bikes for Kids Donor.